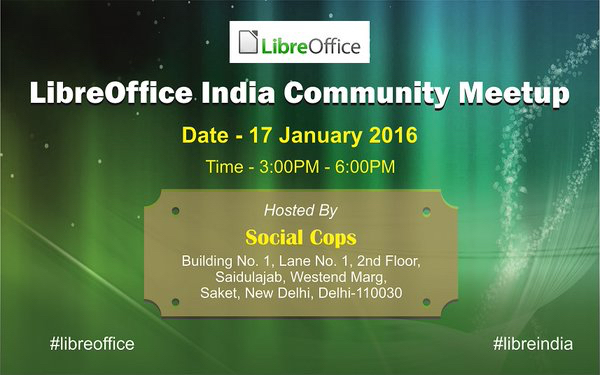 Today, the LibreOffice Indian community meets in Delhi, the capital of India, at Social Cops, to discuss 2016 activities. The event is supported by the FUEL Project, one of the largest localization communities worlwide (India alone has a large number of native languages, and localization is one of the first issues to tackle for any free software community). 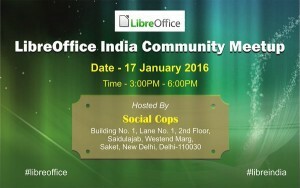 The development of the LibreOffice Indian community is a very important objective for the entire project, as the Republic of India is the second largest country in the world by population, with over 1.2 billion inhabitants. In addition to Hindi, the official language of the Union, there are 21 officially recognised regional languages: Assamese, Bengali, Bodo, Dogri, Gujarati, Kannada, Kashmiri, Konkani, Maithili, Malayalam, Manipuri, Marathi, Nepali, Odia, Punjabi, Sanskrit, Santali, Sindhi, Tamil, Telugu and Urdu.